It wasn’t quite the happy homecoming Memphis coach Tim Mulqueen was hoping for, but in terms of entertainment, this game turned out to be a dead ringer. With the score 2-1 in favor of New York Red Bulls II after a topsy-turvy first half, the broadcast displayed the scores from six concurrent USL games, all reading 0-0. Thanks for making sure we get our money’s worth, 901 FC. Like any good road thriller, the drama has to start pregame. Close to kick-off, defender Wes Charpie pulled out with an injury, which forced Mulqueen to shuffle his pack. Abdi Mohamed jumped over to right-back, while Trinidadian international Tristan Hodge filled in at left-back. Despite the loss, Memphis played a great game. 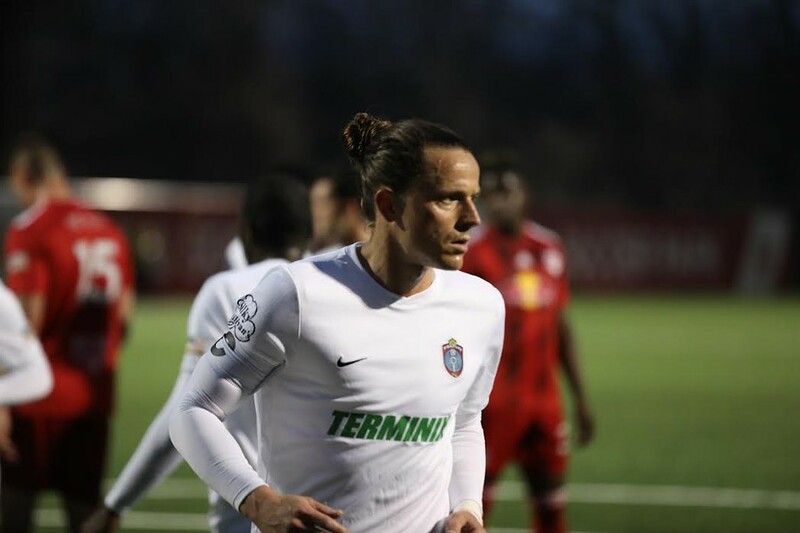 New York held possession in the early stages and pressed the 901 FC defense and midfield, forcing a few turnovers that ultimately proved fruitless for the home team. It was a bold decision to try and play their way out of the high press. But if at first you don’t succeed, try, try again. And Memphis tried, tried again, and it paid off emphatically in the 11th minute. Morgan Hackworth received a pass in the Red Bulls’ 18 and fizzed a low cross through the box which found its way to Duane Muckette, who would have been perfectly entitled to take a crack on goal. Instead, he played a first-time ball back into the center of the box to the elusive Adam Najem, who directed the ball into the net with his knee. Alas, what could have been a springboard for a second straight road victory unraveled just a few minutes later. Overall, it was another good showing from the defense, but the last-minute changes may have played a part in the few concessions Memphis gave up. In the 18th minute, New York was able to get a cross into the box, and Jared Stroud arrived to hit a first-time volley past Jeff Caldwell to equalize. That was probably Mohamed’s man to cover, but the 901 FC defense had been sucked over to one side of the field. Stroud was completely unmarked inside Memphis’ six-yard box. If you leave someone that open, you’re going to get punished. When there are changes in the backline, Burch and Pratzner need to be in constant communication with their fullbacks to make sure mistakes like that don’t happen. With the score tied at 1-1, the game opened up. Memphis pressed more men forward in attack, leading to a great sequence in the 29th minute that wreaked havoc on the New York defense. Mulqueen’s really done a job of drilling into his players the most appropriate times to press high and keep possession and this sequence, full of several shots and good interplay in the final third, illustrated that perfectly. At the other end, having a goalkeeper like Caldwell pays dividends when pushing more men forward. Whenever the Red Bulls threatened on the break, he read plays well and was quick off his line to smother any potential chances. Unfortunately, it was New York who ended the half with the advantage. In the first period of stoppage time, Caldwell parried a dangerous low cross straight to Tom Barlow, who only had to direct the rebound on target. Memphis came out strong in the second half, with Muckette and Burch both having presentable chances. Dally became a little more involved as well, turning on the jets to beat defenders with ease. New York weathered the storm and added a third in the 56th minute, Derrick Etienne capitalizing on a Hodge’s weak headed clearance to drive a shot past Caldwell. At that point, you might expect 901 FC players’ heads to drop. One commentator even suggested that Memphis might go for damage limitation. Pure folly! Four minutes later, Marc Burch smashed a free-kick past New York’s Evan Louro in goal, and Memphis was back in the game. At that point, you just had to throw your hands up and see which way it would go. Both teams hit the post, New York searching for an insurance goal and Memphis desperately trying to find an equalizer. As the game wore on, Memphis opened up more at the back. But by that point, Caldwell had finished erecting a brick wall in front of his net and kept out everything New York threw at him. He inexplicably managed to save from Etienne from only six yards out, and then did one even better in the 95th minute. With the game pretty much over, Barlow drew a penalty in the box. Stroud stepped up to put a little gloss on the scoreline, but Caldwell tipped the shot around the post. A disappointing result, but a fantastic performance by Memphis. Mulqueen’s men created a lot of chances and could have added a few more if they were a bit sharper with their finishing. After the result, 901 FC is 10th in the Eastern Conference standings on four points. The final match of their three-game road trip comes against North Carolina on April 6th. *Adam Najem is truly a classy player. Whenever he has time on the ball, he makes things happen on the offensive side of the game. He moved well in the box to score early, and it was his reverse pass that sparked Memphis’ 29th hectic 29th minute sequence. Play needs to run through him to optimize 901 FC’s chances for victory. Look out for more of his link-up play with Muckette in the midfield. *Defensive midfield is usually an under appreciated position, so let’s take a few minutes to applaud the efforts of Ewan Grandison. He was all over the field yesterday, helping facilitate the ball forward and putting out fires whenever the Red Bulls ramped up the pressure. *Sometimes you just don’t get the breaks. Two sloppy defensive mistakes handed New York two goals. On another day, Mohamed tracks his runner, or Hodge makes a more authoritative clearance. *Another game, another slew of amazing Jeff Caldwell saves. That should put some doubt into opposing attackers’ heads in the games ahead. *901 FC has put in some pretty terrific performances on the road, especially for a new team. Local fans should be enthused by what they see, and expect a rocking atmosphere when the boys come home to face Atlanta United II on April 10th. *At several points during the stream, the camera went of focus, leading to a screen full of blurred colors and inscrutable images. Just a reminder, ESPN, that I’m paying for your service. Get it together!